very talented Olive! Your choice of 4 pillows! 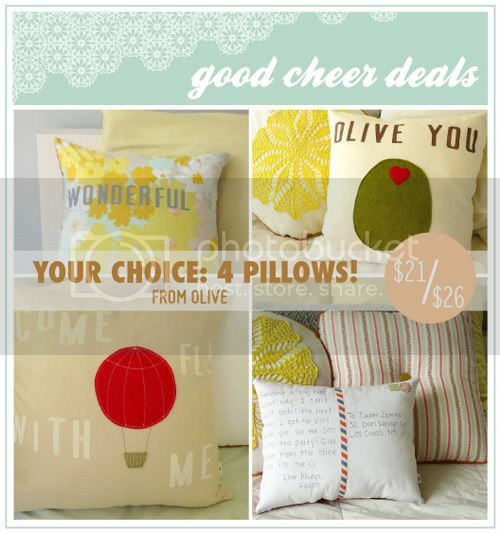 Good Cheer Price: $21 w/free shipping & handling! Good Cheer Price: $26 w/free shipping & handling! Good Cheer Price: $29 w/free shipping & handling! Special reader discount: 20% off your order at Olive Handmade! Enter code "HelloFriend" at checkout! - 10 of each pillow cover available! - Please allow up to 2 weeks for arrival. - This deal is open to all countries! Free shipping to US. Pillow cover shipping charges are: $1 for canada and $2 elsewhere. Please note that postcard pillow shipping chargefor international countries will apply. - Please be sure to visit Olive and support! @megan lane LOVE that one Megan :) that one & the "wonderful" are my top fave's! Thanks for participating in a deal! I love those postcard pillows...what a brilliant idea!! The postcard pillow will be great gifts for my family in California! Love these! That 'wonderful' pillow is, well, wonderful!